The Francesa is a 10-story luxury apartment building atop Nob Hill in downtown San Francisco. Located on the corner of Powell and Sacramento streets, the San Francisco landmark was built in 1923 by renowned architects Gustave Albert Lansburgh, Kenneth MacDonald Jr., and Maurice Couchot, the architect/engineer who helped pioneer the design of all-steel framed and concrete reinforced buildings following the 1906 San Francisco earthquake. Gustave Lansburgh designed some of the most opulent theaters on the west coast between 1900 and 1930, including the Loew’s Warfield, the Golden Gate Theatre, the New Orpheum, the War Memorial Opera House, and the Shrine Auditorium in Los Angeles. He also designed the Joseph Magnin building, and the Art Deco Redwood Room bar in the city's historic Clift Hotel. Kenneth MacDonald designed some of the most impressive residential buildings in San Francisco, including Houses 3, 4 and 5 at Presidio Terrace, both 30 and 34 Presidio Terrace in partnership with George Applegarth, and perhaps MacDonald's most spectacular work, Spreckels Mansion, once home to sugar magnate Adolph Bernard Spreckels. 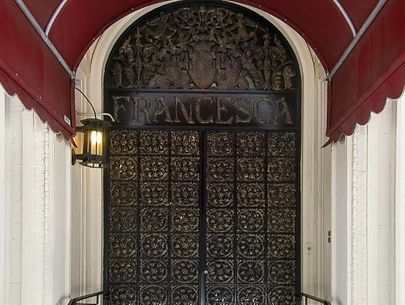 For nearly a century, the majestic Francesca, now home to 40 urban dwellers, has stood proudly along the city's historic Powell Street cable car line and remains an enduring symbol of San Francisco's finest early twentieth century architecture and engineering.